In 2010 I was asked by the Wilson Quarterly to write a short response to an essay on the Civil War and historical memory by Christopher Clausen. I suggested that there is reason to think that the Lost Cause’s influence on the general public, with its emphasis on states’ rights as the primary cause of the Civil War, is gradually being supplanted by slavery. In the latest issue of Civil War Book Review, Gaines Foster briefly explores the landscape of Civil War memory studies and along the way suggests that this may indeed be the case. For many scholars and journalists, the idea of a persistent and powerful role for the Lost Cause extends beyond the 1960s; they claim to find in the contemporary South a widespread and deep commitment to the Lost Cause or see various examples of the white South still fighting the Civil War. The continuing battle over the Confederate flag and other Confederate symbols would seem to support such views, although the flag fights may be even more immediately shaped by matters of race than the Lost Cause celebrations of the late nineteenth century. The Sesquicentennial, thus far at least, seems to provide conflicting evidence about the continuing power of the Lost Cause and the centrality of the Civil War to American historical memory. Congress, despite lobbying by various groups, has not created a commission to oversee a national commemoration of the Civil War, as it did for the centennial. The National Park Service has pointedly sought to commemorate and not celebrate the war and has done a very good job of trying to promote a complex view of its history. Many museums and historical societies, as well, have sponsored programs or exhibits. Anniversary celebrations, such as those marking the firing on Fort Sumter or the battle of Gettysburg have occurred, but seem hardly as popular as one might expect. Save for Bill O’Reilly’s Killing Lincoln—which gave birth to a “Killing” and not a Civil War franchise—books about the Civil War have not stormed to the top of the best seller lists. Two polls taken in conjunction with the Sesquicentennial yielded different results and do show some persistence of Civil War memory, but at least one of them also points toward a fundamental change. A Pew Research poll found that 56 percent of Americans still think the Civil War is relevant to American political life today. That same poll found that 48 percent of Americans, north and south, thought the war was about states’ rights and only 38 per cent said it was about slavery. A CNN poll, released about the same time, found that 54 percent of Americans thought slavery was the main reason for the war and 42 percent said it was not. (The difference in the two polls on the cause of the war may result from the differing ways each posed the question. That with the higher figure for slavery as the cause did not offer “states’ rights” as an alternative; the other did.) Blacks remain much more likely to say that slavery was the main cause, while white southerners were less likely to say so than white northerners. Still, these polls found that almost 49 percent of southerners said the war was mainly about slavery and that only 52 percent of them said it was appropriate for politicians to praise Confederate leaders,—percentages that would have been very different, I’m willing to wager, if a poll had been taken in 1913. Maybe its because I live in New York, but when I speak to my law students about the Civil War they rarely identify states rights as the cause of the war, but most also say that slavery was not the cause either. Since my students tends to view nearly all 19th Century whites as racists, they can’t conceive of how racist northerners would sacrifice their children to liberate blacks, whom they despised. 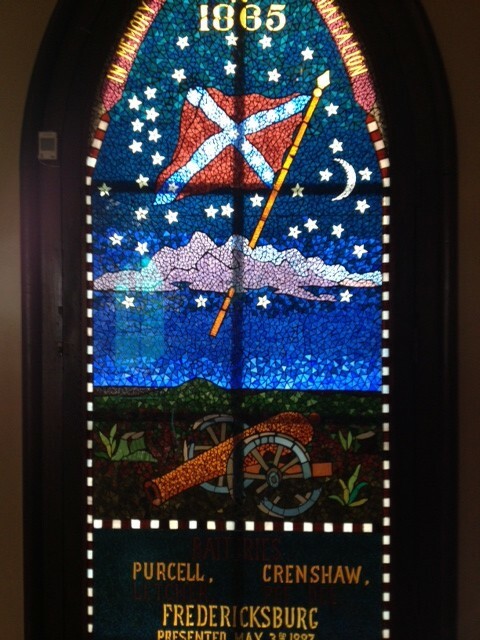 I like the picture ot the window in the Confederate Memorial Chapel in Richmond. I do not believe Slavery was the cause of the War Between the States. It is certainly true that that abomination ended, except for 4 northern states that were not affected by the proclamation. There would not have been a war without secession and secession began as soon as it was clear that a Republican committed to ending the expansion of slavery had been elected as President of the United States. As for the states and areas not covered by the Emancipation Proclamation, to which I assume you are referring, the Constitutional basis for the Emancipation Proclamation was the war powers of the President which could not extend to loyal areas or areas under Union control. That represented, at most, just under three years until the ratification of the 13th Amendment to the US Constitution on December 6, 1865. The 13th Amendment ended slavery throughout the US immediately, without compensation, and without any reference to status as rebel or loyal. What is the context for the discussions with law students? Alex, I teach immigration law and Immigration Practicum at Hofstra Law School on Long Island in New York. I also blog about immigrant participation in the Civil War for an immigrant web site (link below). A lot of my students (and even some students from other classes) read the Civil War series. Since a lot of law students were either history majors or in related fields with a history minor, a lot of them like to talk to me after class or during private meetings about the war. As far as I know, none have advanced degrees in history, but a lot of them took 19th Century American history courses. My students tend to come from Ivies, major state universities, and large private universities like Syracuse or NYU. My class tends to be about half white, half non-white and balanced in gender. Hope that provides context. It’s a shame they have such a trendy view of the war. I haven’t read any studies about this, but in my other readings I always got the impression that a lot of northerners were not racists. Maybe a little prejudiced, but most seemed willing to sacrifice their lives for slaves once the Emancipation happened. The opposition tended to come from property owning elites, usually in the officer corps or politicians. I could be wrong, though. I say their view is trendy because I’ve heard a lot of people say similar things. That the war wasn’t about State Rights but they don’t know enough to confidently cite any other reason. Also, it’s not an either/or proposition. A person could be a thorough bigot and see slave labor as a threat to the interests of free. Furthermore, a person does not have to believe that members of a group are his or her equals in order to believe that it is wrong to treat them as property, to be able to separate husband from wife, parents from children. I’ve always believed that was part of Lincoln’s complex attitude about race and slavery. He knew that no one, looking at the newborn Lincoln, would have imagined that he’d be anything more than his father was. I think he believed in people being able to make the best of whatever talents life gave them, without artificial barriers being put in their path and that the results of their labors should go to them and them only. I think the states rights theory as a cause is inextricably linked to slavery. After all, what they wanted was the right of the states to maintain slavery and an economic system based on slavery. I don’t think it’s possible to separate the two, it’s just that Lost Cause folks prefer to call slavery culture by another name. No one ever went to war or organized a big protest rally over “states rights” as an abstract principle. It’s always because they’re mad about some specific and concrete thing that they oppose. That was true in 1860, it was true in 1958, and it’s true in 2013. The passions that create and justify wars are often distinct from the forces that cause them, and the former can be moved by an informed minority, while the latter is almost always required to be moved by a poorly informed majority. The Civil War was caused by the South attacking the North and provoking confrontations based on its own fears and assumptions of Abolitionists taking control of subjugating the South to their personal beliefs. The South’s secession, and economic, social, military, and political challenge to the North was taken as no less than what it might have effected, the existential defeat of the notion of the United States and freedom from England fought for and won less than a century earlier. 1. “Division and Reunion” (not his “History of the US”) was Wilson’s major Civil War work, and it was meant to strike a balance between North and South. Many Lost Causers were not fond of it as being too “pro-Yankee.” Basically he argued that the South was right that in 1787 the southern states assumed they could leave, but by 1860 the nature of the Union had changed and secession was no longer possible. He also argued that the Klan was an understandable outgrowth of white anger after the war, but that it was indiscriminately violent. “Brutal crimes were committed, the innocent suffered with the guilty; a reign of terror was brought on, and society was infinitely more disturbed than defended.”” Kind of weak stuff, but about as close to a real denunciation as you’d get from a white southerner in the early 1890s. He also argued that Reconstruction was a disaster, but that was probably a majority opinion in the north and south alike by then, at least among whites. 2. “Birth of a Nation” was shown at the White House not to honor it, but because the household was in mourning so public visits to the theater were out of the question. The big showing was for Congress and the Supreme Court the next evening at the Press Club. Initially it was that showing that got the majority of attention. it was also not the first movie shown at the White House. That’s a common mistake, but “Cabiria” was shown at the White House in 1914. Wilson did eventually issue a very weak denunciation of the film, which the NAACP published, but it was largely ignored outside of the small civil rights community. 3. Wilson “sanctioned” the lynching of Leo Frank? OK, that’s just bizarre. The man who hired the first Jewish professor at Princeton and who relied on Louis Brandeis as an adviser and friend sanctioned the lynching of a Jew? And I am not sure why you think Wilson had anything to do with Frankfurter being nominated to the Supreme Court, which he was in 1938. 4. He didn’t order the Post Office be segregated, but he allowed his cabinet officers, most of whom were southerners, to segregate their departments. A handful of federal offices were not segregated because their heads did not wish to do so. Something that’s always puzzled me: how could anyone who’s heard of the Fugitive Slave Act believe that the Southern cause was States’ Rights? The same kind of people who, in modern times, rail against “big government” while wanting to Constitutionally ban gay marriage? Politics seldom make sense, and people can be very hypocritical. I can believe that supporters of the Fugitive Slave Act would demand “states’ rights” when it suited their needs. Seems like standard American politics to me. The so-called “Lost Cause” is a bunch of revisionist crap thought up by a school of morons wishing to frame the South’s side of the war as “moral.” How can such a word as “moral” be juxtaposed with such a list of historical fallacies as put forth by this erroneous school of thought? The Confederates were no saints; they were traitors who tried to rip this country apart and destroy what the Founding Fathers and the colonists fought to preserve during the Revolution. And people want to honor that? That’s my issue with the Confederate flag; I don’t think it’s racist, but I don’t think it’s “Southern pride” either. There’s only one flag we all should be under, and it’s the UNITED STATES flag; not the other flag. That other flag is a historical symbol of treason; it always has been and always will be. One Southern argument re “state’s rights” was that the Fugitive Slave Act enforced each slaveholding state’s “right” for its citizen’s human property (ugh) to be considered real and legitimate throughout the nation. That’s how they viewed the slavery-expansion question, which was the core area of differences that led to war: If a slaveholder couldn’t take his human beings into a newly-formed territory/state, and expect them to be legally considered his chattel, then his rights as a South Carolinian (or whatever) were trampled. Had the North completely compromised on the expansion question (agreeing that all new states would be slave by default), even while doubling down on all those terrible-acts-of-Northern-aggression-that-had-nothing-to-do-with-slavery, there would almost certainly have been no secession or war; neither side had a further compelling issue. And if (just to play with insanity here) the Union had enacted a Constitutional amendment morphing all states free or otherwise into permanent slave states, the South would have given them anything they wanted (or been suspicious about the change of heart).